Why do I need a food mill? Soups – sure you can also use an immersion blender and we use ours too. But for a velouté for example or a nice smooth soup, there is nothing better than this food mill. You will feel like velvet is going down your throat! Fresh purées – great to make fruits purées (for coulis for example) with fruits with seeds (raspberries, strawberries), the fine mesh disc retains seeds and skin so no need to strain as you would when puréeing using an immersion blender or a blender — a true time saver. Creamy Sauces – for tomato based sauce, you can choose the disc (fine, medium, coarse) and make your sauce as chunky or creamy as you wish, you can even make your own V8! Homemade jellies: the fine mesh disc holds back seeds and skin of fruits so just like with purées, no extra step for straining is needed. The medium disc is great to make homemade applesauce too. Mashed potatoes and chunky tomato sauce: this food mill has a coarse disc which is just right to make mashed potatoes or chunkier sauces. Baby Food: great for new moms and grandmas, this food mill can help get baby started early on healthy eating habits with all natural baby food. You can start with mashing food (potatoes, green beans, peas, carrots, cooked apples, poached pears or whatever the rest of the family is eating for dinner) with the fine or medium disc and graduate to the coarse disc once the baby is old enough for chunkier food and get bébé (baby) ready for real food. Considering the cost of baby food jars, the OXO food mill is really a bargain! How do I use a food mill? Very simple! Unfold the feet, place the disc you want to use inside the food mill, lock it into position (very easy to do), put the food mill on top of a pot or mixing bowl (up to 11 inches in diameter), scoop in the food you want to purée, and start making your favorite soup, sauce, homemade mashed potatoes, etc. What should I be looking for in a food mill? Durability: stainless steel is best to handle food at different temperatures (especially hot). Easy to Use: nobody should need an engineering degree to assemble and disassemble a food mill! Sturdiness: the design needs to be sturdy so you can easily crank the handle without the food flying off the kitchen counter. Versatility: several grinding discs should be included with the food mill so you can prepare food with various textures and select the disc based on the type of fruits and vegetables you are preparing. Convenience: although not a deal breaker, dishwasher safe is better — it is a time saver. 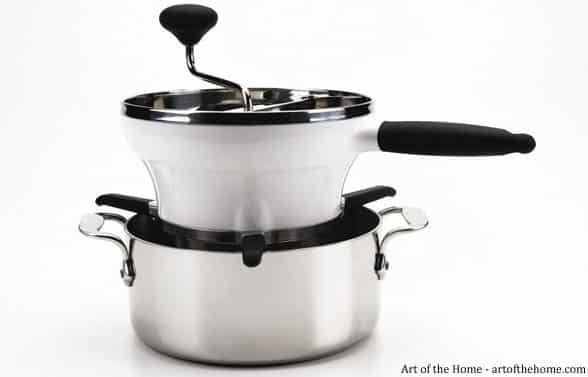 Price: less than $50 is a good value for this type of small kitchen appliance. Durability: stainless steel inner bowl — perfect for hot food. The outside bowl is made of quality white enamel — easy to wash and looks great. Easy to use: this food mill is very easy to assemble and disassemble — it has a convenient and easy to use release button. Sturdiness: the legs of the food mill are coated with a rubberized surface so no slipping off – this is a great feature! The non-slippery rubber handle is very comfortable and allows you to get a good grip – critical when you turn the blades. Finally, the knob is very comfortable to grab making the cranking that much easier. 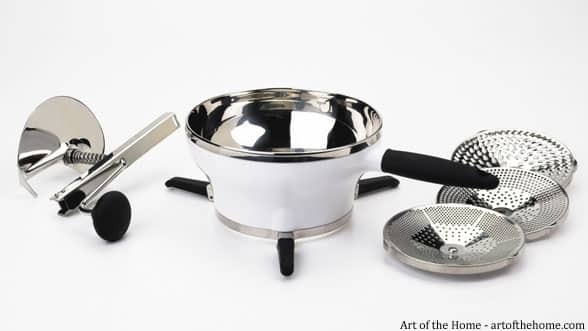 Versatility: the OXO food mill comes with 3 stainless steel grinding discs: fine (for creamy sauces, purées, etc. ), medium (for soups, applesauce, etc.) and coarse (for mashed potatoes, baby food, etc.) which lets you achieve a wide variety of textures. Convenience: The feet can fold so it minimizes storage space – always a plus. Finally, although sometimes a simple rinse is enough, this food mill is dishwasher safe. Price: very reasonable at Amazon and currently offered with free shipping. None so far. But consider that this food mill has a 4 cups capacity so depending on the quantity of cooked food you need to purée, you may need to do a few batches but we have not found this to be a problem. 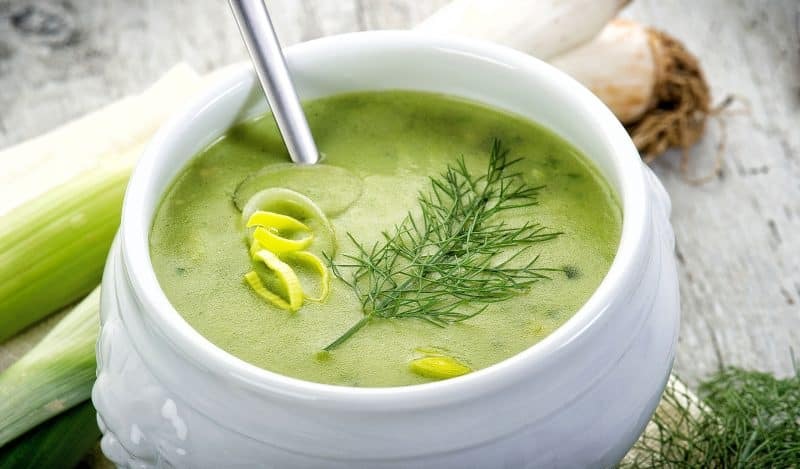 So to enjoy some smooth soups this fall and winter (and so much more!). Art of the Home recommends the highly rated, easy to use, and reasonably priced (currently eligible for “FREE Super Saver Shipping”) OXO Good Grips Food Mill.